Find your own ski in and out by owner rental in and near Aspen -click on this link! 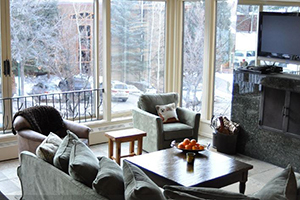 Trip Advisor Listing #FKN2895171-Located in Aspen Core, The Gant has easy access to everything Aspen has to offer -- the slopes, hiking, biking trails, and all the wonderful special events, music, shopping, restaurants, and night life. This oversized one bedroom has a full kitchen, king size bedroom with balcony, wood burning fireplace, 55' flat screen, spacious living room with additional balcony and views of Aspen Mountain. Top Floor Condo. 2 BR/2BA , Great View! - -2 bed, 2 bath, slps 5, Ave. nightly $365/nt - Book it! Very Reasonable! 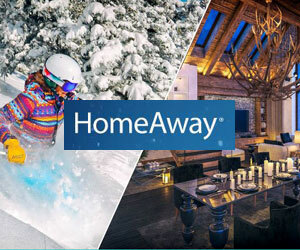 Homeaway 3842458 -There is no better location in Aspen than the Chateau Dumont! Less than one block from the Silver Queen Gondola, 2 blocks from the Ruby Park Bus Station (giving free and easy transportation to Aspen's 3 other ski mountains), and directly across the street from the market, if you feel inspired to make a tasty meal, and the liquor store, where you can get your favorite après beverages. 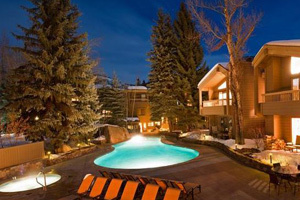 This building is also just steps away from the world famous Sky Bar Hotel, the après place to be in Aspen, featuring an outside pool and hot tub. If you want a night on the town, there is no better location for enjoying downtown’s extensive restaurant and shopping opportunities. Chateau Dumont #20 is a choice top floor 2 bedroom/2 bathroom condo, sleeping up to 5 guests and with a view of Aspen Mountain right out your front door. Being on the third floor, this condo features vaulted ceilings with skylight, offering warm natural light to the living and kitchen area. Other highlights include a fully supplied kitchen, dining area in addition to a living area, a flat screen TV, and a ready to go wood-burning fireplace to top off your winter vacation in Aspen. The Master bedroom includes one king size bed, private bath, closet, and flat screen TV. The second bedroom, also featuring vaulted ceilings, includes two twin size beds. For your convenience, Wifi and washer and dryer are provided in the unit. The central courtyard of the Chateau Dumont includes a communal table and chairs for lounging and gas grill ready to fire up! Parking is available on premises: garage parking (which is first come first serve) and off-street parking onsite. Newly Renovated - Contemporary Condo - Ski in/Ski Out Right in the Heart of Town -3 bed, 2 bath, slps 6, ave $774/nt -- Book it! VRBO 727507 -Stunning views! Beautifully furnished! Steps to everything! Bedroom 2: 1 king; 50 inch flat screen tv; custom walnut built in closet; Bedroom 3: 2 twin beds; 50 inch flat screen tv; custom walnut built in closet. Both bathrooms were renovated about 4 years ago, Bosch washer and dryer. The kitchen has Bosch appliances, caesar stone countertops, wine fridge, All Clad pots and pans and every goodie you need to prepare a fabulous meal! 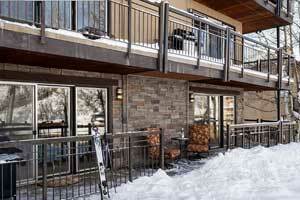 Ski-in-Ski-Out Deluxe 3BR/3 Bathroom Crestwood Condo at Snowmass Village - 3 bed, 3 bath, slps 8, ave nightly $448/nt- Book it! vrbo 820947 - -The best location in Snowmass: Perfectly placed just above the main Gondola plaza this 3 (full size) bedroom 3 bathroom luxury condominium provides genuine ski-in ski-out access right from the from deck. Located just above the Base Village restaraunts and with ski access down to either the main loading plaza for the Snowmass Gondola or the Village super 8 lift you will have access to the whole of the Snowmass ski-area. Friends, guests and younger (or older) family members are not forgotten. Skiers can pop in for a drink or snack without taking off their ski gear and non-skiers can enjoy the hot tubs, pool, gym etc that the resort provides, walk around the Village or perhaps take the free bus into Aspen for a superb breakfast, luxury shopping or to enjoy the local seasonal entertainment this rich and friendly areas offers. Be assured that younger children have a large front yard in which to build their collosal snowman meters from the deck of this ground floor unit within clear sight of parents and carers from their comfortable chair in front of either of the two gas log fireplaces. 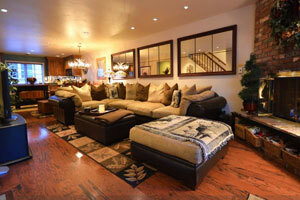 Lovely 4 BR Townhouse - Great Location Near the Gondola - 4.5 bath, slps 8, ave nightly $900/nt- Book it! vrbo 85214 -Exceptionally clean and well maintained tri-level home. 4 bedrooms, 4 1/2 baths. Will comfortably accommodate up to 8 guests. Two master bedrooms with king beds, TVs, ensuite baths. Two guest bedrooms with twin beds (convertable to kings), TVs, ensuite baths. Comfortable living area with TV, fireplace, dining area for 8, powder room and well-stocked kitchen with plenty of plates and serving dishes are located on the main level. Outdoor heated pool and hot tub. Unlimited U.S. long-distance phone service and WI FI provided. Discount lift tickets. For the ski enthusiasts, a short walk takes you to the Silver Queen Gondola, or Chairlift 1A is easily accessed one block in the opposite direction. The free shuttle service is one-half block away, which takes you to the surrounding ski areas of Aspen Highlands, Buttermilk, and Snowmass. 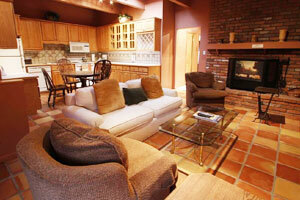 Ski in/Out Ajax, Explosive Mountain Views, 1.5 Blocks to Gondola -Ave. nightly $609 - Sleeps 7 - 3 Bdrms, 2 Baths - Book it! VRBO 390550- Gorgeous, simply gorgeous. Gaze at Ajax mountain through floor to ceiling glass windows while relaxing in front of the fireplace after a full day of skiing or wonderful aspen activities. Use the Durant's ski in/out Ajax access from the 3rd floor 'bridge', or walk a block to the Gondola or bus to Snowmass, Buttermilk, and Aspen. Relax sore muscles in the hot tub or heated pool. 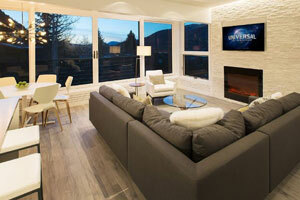 Aspen Colorado Jewel-4 bed, 4 bath, slps 10, from $900/nt- Book it! 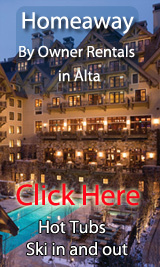 Find your own ski in and out by owner rental in and near Alta -click on this link!